After two decades of dwelling in the nether regions of the underground Belgian stalwart Johan Antonissen (mostly known for his work with death metal pioneers Suhrim) has teamed up with Portugese and Argentinian members to form an international death/crust outfit. In record time Marginal stomp, rip and tear through 14 songs (the longest clocks in at 3:23) screaming rightful indignation at the world around them. Civil disobedience, anti-capitalism/consumerism, mass media propaganda, fear mongering, the military-industrial complex seem to be the main subjects. Antonissen has adopted a different vocal style for this outfit, going for a Sven de Caluwé-like bark that is tonally different from his patented grunt. The playing is tight, the performance breakneck and its broad palette of influences only make it all the stronger. If some of the song titles sound like could have been taken from an Agathocles album, that's probably the way it was intended. Call it grindcore, gritty crust, concrete sounding punk or relentless d-beat - it doesn't really matter. Marginal takes influence from all of the above, and just puts the pedal to the metal. 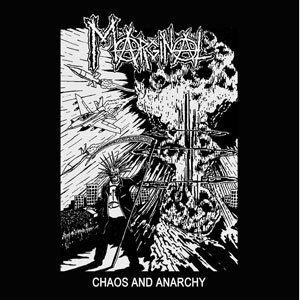 This will appeal to fans of Agathocles, Benümb, Discharge, Disrupt, Inhumate, Multinational Corporations, World Downfall and early US/UK grind institutions as Brutal Truth, Carcass, Napalm Death, Repulsion and early Terrorizer. It's crass, it's loud – and sometimes this sort of chaos is all you need. Marginal delivers.